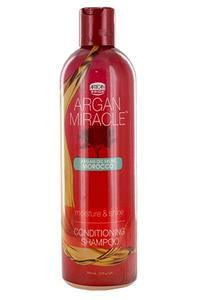 Home › SHAMPOO › African Pride Argan miracle conditioning shampoo. Clean, detangle and hydrate with our Moisture & Shine Conditioning Shampoo. The shampoo is enriched with pure Moroccan argan oil to gently cleanse, restore and fortify your hair against breakage and split ends. Apply to wet hair, lather and rinse to gently clean, strengthen and repair hair for a naturally silky smooth finish.